I always thought that if you weren’t dining out for Valentine’s Day you should cook something with meat. What better way to show your love than with a thick, juicy pan-seared ribeye or boozy beef bourguignon? But as V-Day rolled around the idea of meat became less and less appealing to me. I had just returned from a week in L.A. where many of my meals were light and summery (think: fish tacos, mussels, giant kale, veggie, and quinoa salads, and especially daily fro-yo!) and the idea of beef just seemed…heavy. Plus, I wanted to show myself a little love that day and make it to a yoga class, which meant I didn’t have all evening to cook. There’s also the fact that since Robert would likely be working until 9 or 10 pm slaying accounting dragons I’d probably be dining alone (I can’t wait that late to eat!) So as much as I wanted to whip up something spectacular, I also wanted to be practical and make a meal we’d both enjoy that wouldn’t be too heavy and would provide ample leftovers that we could continue eating throughout the week. Two things came to mind: Make it spicy (his fave) and use the slow cooker. I browsed through my slow cooker cookbook and landed on this recipe. Done. The heroes in this dish aren’t the main ingredients (chicken, corn, and black beans), but the things you add at the end: Chipotle chiles in adobo, chopped cilantro, and a squeeze of lime. Without them you’d have a pretty great chicken stew that’s similar to a chili. However, those garnishes brighten the flavors and the chiles lend a smoky depth. While this meal is no beef stroganoff (a serious contender when I was recipe hunting) I’m pretty sure neither of us were disappointed. And in case I had any doubt, Robert’s text the next night at 10:15 pm when he got home from work and heated up dinner (“Best. Leftovers. Ever.”) was pretty high praise from a guy who loves leftovers. Add onions, jalapenos, garlic, tomato paste, oil, and chili powder to a microwave-safe bowl (such as glass). Microwave in 1.5-minute intervals, stirring after each one, for a total of about 6 minutes, until onions are softened. Add to slow cooker. Stir broth and tomatoes into slow cooker. Season chicken with salt and pepper and place in slow cooker. Cover and cook on low for 4 to 6 hours until chicken is tender. Transfer chicken to cutting board. Allow it to cool slightly and then shred using two forks. Stir corn and beans into slow cooker and cook on high for about 10 minutes. Add shredded chicken, chipotles, chipotle sauce, and allow to heat through–about 5 minutes. Add salt and pepper to taste. Spoon stew into bowls. Garnish with chopped cilantro and squeeze of a slice of lime. 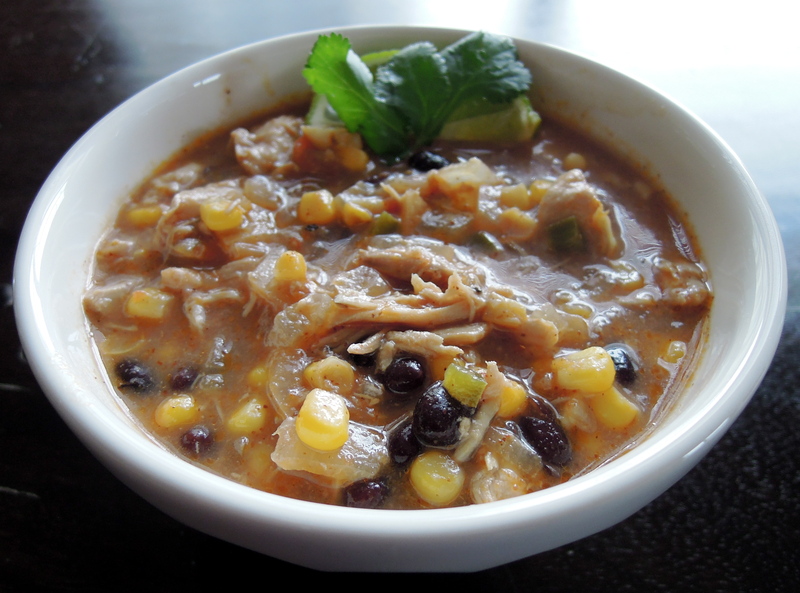 This entry was posted in Chicken, Slow Cooker, Stew on February 16, 2012 by Paige Greenfield. 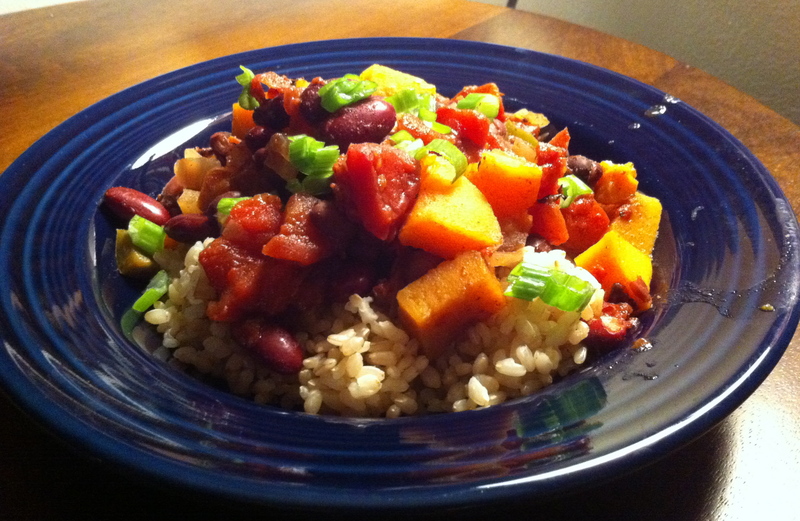 Vegetarian chili with sweet potatoes. How could I possibly not make this recipe? Plus, it uses my poor dust-collecting slow cooker! (Don’t worry I scrubbed it before cooking.) The moment I saw those ingredients I knew it was only a matter of time before it happened—and last week it sure did. This is not your average chili. In fact, I’d encourage you to think of it more as a bean and sweet potato stew. There are some unique ingredients that made me pause after I eventually stopped salivating over the title. Unsweetened cocoa? Ground cinnamon? What the heck were they doing in my dinner? I decided to take a risk and cook with these unusual chili ingredients and I’m so glad I did! At first bite, you wouldn’t really know they’re in there (after all, it’s only 2 tsp of cocoa and ¼ tsp cinnamon in a meal that serves four) but they impart a particular earthiness to the chili that you won’t find in most. There’s also a distinct lack of spiciness (actually, funny story: I bought a jalapeno to add to the recipe and lost it. Who loses a jalapeno? When I went back to Whole Foods later in the week and told the checkout person about my missing jalapeno they ended up giving me one I had on the conveyor belt for free. Score!) In any case, the recipe errs more on the side of savory and perhaps just a little sweet. This meal is ideal for fulfilling a serious comfort food craving while still being healthy and easy to prepare. This entry was posted in Slow Cooker, Stew on November 6, 2011 by Paige Greenfield. I was sold. Game on. Fortunately, it turned out to be a winning night for both me and the team. Place potatoes, corn, celery, carrots, onion and garlic in slow cooker. Stir in salsa, salt, cumin, chile powder and pepper. Distribute chicken evenly on top of vegetables and pour chicken broth over chicken. Cover slow cooker and cook stew on high for 4 hours. 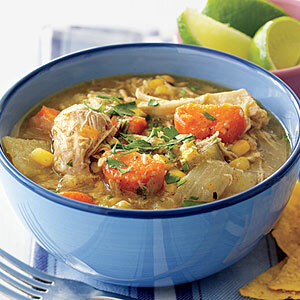 Transfer chicken to a plate and shred with two forks into bite-size chunks; return to slow cooker. Add black beans and continue cooking until they’re heated. Serve with corn bread muffins (which I did) or tortilla chips (which I also did). This entry was posted in Slow Cooker, Stew on September 13, 2011 by Paige Greenfield.